When I moved to downtown Orlando, just over a year ago, there was one purchase that assisted me in both saving money and enjoying the city to the maximum: a bicycle. And if you know anything about Florida, you know that it rains. A lot. In the summer, it is fairly incessant. To ride, I need a bag that is waterproof to keep certain items dry. Previously, I had a DryComp Ridge Sack (primarily used around the water) that was a wonder, but the piping on the shoulder straps broke when one of my friends was borrowing it last year. The main reason I took exception to the breakage was because that piping held on the two pieces of chest strap that buckled in the middle. With the piping busted, if I cranked the straps tight, the plastic attachment on the chest straps would slide right off the piping and be rendered useless. My friend didn't really use the chest strap anyways, so I gave him the pack,but I took issue with the mechanical weakness and decided to call Outdoor Research for a new bag; they mailed one to me straight-way. Now that I've had a little time with the bag, I can say that it's just as superb as the previous, but...more durable, comfortable, secure (with auxillary straps), and just as water proof. 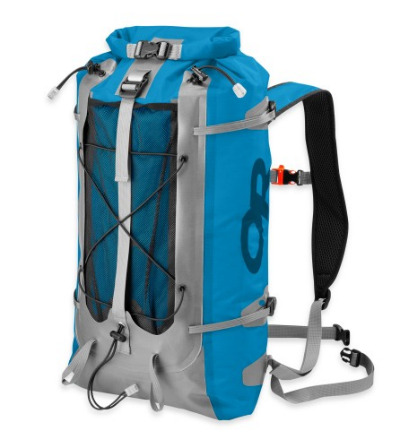 Now, when I head to the park, hit the trails, or mount my bike for a ride around the City Beautiful, I can be sure that not only will the contents of my bag be dry, but that I will be comfortable with with the DryComp Ridge Sack on my back.